First cut a 6" x 9 1/2" piece of white card stock and fold it in half for the base, a 4 1/2" x 5 3/4" piece of pink for the middle layer, a 4 1/4" x 5 1/2" piece of white for the front layer and a 3" x 3 1/2" piece of white for the image. Then create the background by randomly stamping the sprinkles stamp from the Sprinkles of Life set in Stampin' Up! So Saffron, Pool Party, Pink Pirouette and Wisteria Wonder inks on the white card stock. 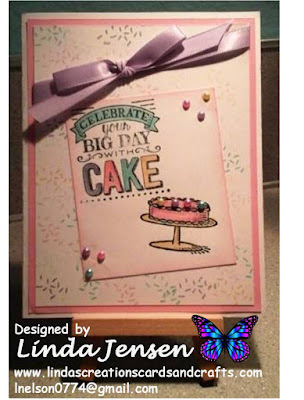 Then stamp the cake and sentiment using stamps from the Big Day set in Stazon Jet Black ink and color them with the colors mentioned above and a blender pen or aqua painter. Next sponge the edges with Pink Pirouette ink and attach the self adhesive pearls and ribbon. 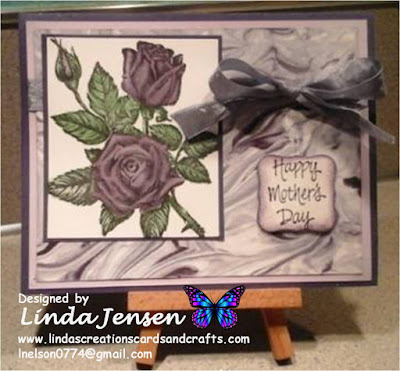 Then assemble the card and enjoy!